Sincere apologies for the long break in the frequency of my posts. Like I said before, when life/marriage hits you it (usually) doesn’t wait for you to catch-up. Life has been super busy since my last post but, I have tried to make time for things I enjoy hence, this post! 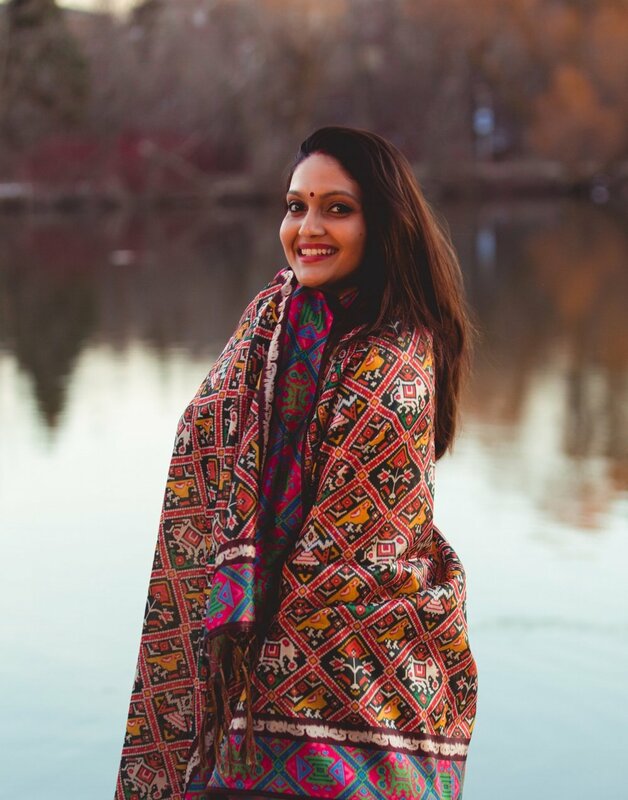 The gorgeous silk patola-inspired dupatta/shawl was the impetus for this past due post. It is a gift from my beautiful cousin Ananda! I can pair it with many different outfits or just use it as a shawl with jeans or a nice dress. Because of the beautifully harmonized colours on the dupatta, I can pair it with almost any colour! I decided to go with a gold anarkali top and gold heels. The world history of textiles is incomplete without Indian traditional textiles. India is known not only for its culture and crafts but also its majestic textile art! Patola is one of the famous textiles from Gujarat specifically from Patan. Patolas from Patan are unique in their geometric floral and figurative patterns. I can’t imagine the amount of visualization and mind-boggling coordination skills required for this kind of art! Patola sareess continue to remain highly prized as only the royals owned/draped them back in the day. These silks signify prosperity, good luck and high-end traditional way of life. They are passed on to newlyweds and worn during baby showers as good luck. Square patterns represent security whereas the elephant, parrot and peacock represent good luck. “The patola craft faces a challenge of not extinction but the loss of originality in the process of fitting and existing in a world that is inclined towards standardization and consumerism.” Read more here. Want to read/learn more about patola? Read more about the art of patola here. If you are too lazy to open the link below are a few highlights from the article. It takes the combined effort of four weavers anywhere between four to six months, sometimes even more, to weave a single saree. This unique weave, usually made from silk, is a double Ikat and combines the techniques of tying, dyeing and weaving. Many consider Patola as the ‘ultimate manifestation of weaving perfection’ because the displacement of even one thread can result in a deformed pattern. Also, the dyeing and the weaving process is extremely complicated, requiring mathematical precision coupled with a vivid imagination. The double Ikat weave means once the saree or fabric is woven, you cannot differentiate between the sides – the colour and the intensity, the feel and the look, are the same on both sides. Before I end this post, I want to leave you with a paragraph stolen from “You are a badass” by Jen Sincero. I highly recommend this book! I just started reading it 2 days ago and haven’t gotten too far yet but I have heard lots about it. I will share my thoughts when I finish reading it! That being said, I will try to write/post more often even during the days when life decides to hit! :p In the next blog post, look out for “A budget friendly Alberta travel guide”. *Note- patola-inspired dupatta. Not a real patola saree.